From the book The Boy Who Would be Tsar The Art of Prince Andrew Romanoff. (2006.) Photo is from the mid 1920s. Sometime early next year, perhaps after the birth of their first child, the Duke and Duchess of Sussex will move into Frogmore Cottage, a small manor house within the precincts of the better known Frogmore House in Windsor Great Park. The Duke and Duchess will be the first members of the British royal family to make Frogmore Cottage their home, although other royals have used the house as a retreat or a place to spend the weekend. Frogmore Cottage has been the home of Henry James’ father; Abdul Karim, Queen Victoria’s beloved Munshi lived in the cottage; a nursery for the children of the Prince and Princess of Wales (King George V and Queen Mary); a safety net for the nearly destitute Grand Duchess Xenia of Russia, a sister of the murdered Nicholas II, and for more than 70 years, the home of loyal Windsor Castle staff. Queen Charlotte, the consort of George III, acquired Little Frogmore, in the north-west area of what is now the Frogmore estate, in 1790. The 3rd Earl of Harcourt, a “loyal servant and friend of both the King and Queen,” was able to obtain the Crown lease of this property for the Queen. There was a small house on the estate, which the Queen used as a retreat for herself and her unmarried daughters. The small house that they used was renamed Amelia Lodge, in honor of Charlotte’s youngest daughter, Princess Amelia (1783-1810). The Lodge underwent several additions and changes, which suited the Queen as she looked forward to her “sweet retirement” at Amelia Lodge. Two years after the acquisition of Little Frogmore, Queen Charlotte purchased the Great Frogmore estate, which had been owned the Aldworth family until the early part of the 18th Century, when the main house was leased to the Duke of Northumberland, the son of King Charles II and the Duchess of Cleveland. During the next few decades, the Great Frogmore estate passed through several owners including Edward Walpole, the second son of Prime Minister Sir Robert Walpole. The two estates, now under one owner - the Queen - led to numerous changes. Amelia Lodge was demolished and the Queen devoted her energies to Frogmore House, which was “altered and greatly extended,” according to Frogmore House's official guidebook. Queen Charlotte considered Frogmore to be the place that will “furnish me with fresh amusements each day.” It was at Frogmore that the queen was able to create a “calm retreat” for herself as she wrote, “a life of constant hurry and bustle is not reasonable.” Charlotte preferred the country life. The Frogmore estate was inherited by Charlotte’s eldest unmarried daughter, Princess Augusta (1768-1840) when Queen Charlotte died in 1818. Although most of the contents of the house were sold at auction after the queen’s death. It was not until 1841, after the death of Princess Augusta, that the Crown purchased the estate from Augusta’s executors. An Act of Parliament allowed for the estate to become a part of the “royal domain” at Windsor. On the grounds of Frogmore House is the smaller Frogmore Cottage, which was often used as a retreat by Queen Charlotte and her unmarried daughters. In May 1841, Queen Victoria offered Frogmore House to her mother, the Duchess of Kent, where she lived for the next 20 years. Frogmore Cottage was rented out to tenants. In the mid-1840s, the American theologian Henry James, Sr., lived at Frogmore Cottage with his wife and two young sons, William and Henry. The family returned to the United States in 1845. Young Henry grew up to write numerous books including Daisy Miller, The Turn of the Screw and Portrait of a Lady. Several years after the James family returned to America, the road in front of the house was closed to the public in order to give more privacy to the royal family. I found few references to the Cottage from the 1850s to the 1890s, although, due to its close proximity to Frogmore House – and Victoria’s affection for the house and gardens – it may be assumed that the cottage may have been leased or used as a retreat for members of the royal family. The Cottage would soon have a new resident, however, as in October 1893, Queen Victoria offered the cottage to her Munshi, Abdul Karim. It was reported that the house was “being decorated, refurnished, and generally renovated for his occupation.” Abdul Karim and his family lived at Frogmore Cottage until shortly after Queen Victoria’s death in January 1901, when they returned to India. None of Victoria's close family members shared her affection for the Munshi. She would often join he and his family for tea at Frogmore Cottage. Victoria's friendship with Karim was platonic. He acted as one of her secretaries. The Queen was eager to learn Urdu and was able to write notes to Karim in his native language. King Edward VII and Queen Alexandra enjoyed having quiet luncheons or tea at the cottage during the summer, especially when they were able to spend time with their grandchildren. In August 1904, Truth, a British magazine, suggested that King Edward VII was going to offer Frogmore Cottage to his daughter, Maud and her husband Prince Carl of Denmark, but some people at Windsor maintained that “the King had offered the place to Prince and Princess Louis of Battenberg. Princess Louis was the King’s niece, Princess Victoria of Hesse and By Rhine, the eldest daughter of his late sister, Princess Alice. Neither story proved to be true as Frogmore Cottage was largely being used by Prince and Princess of Wales as a nursery for their young children. King Edward VII died in May 1910 and was succeeded by his son, George. In October of that year, one newspaper reported that George V intended to keep Frogmore House and Frogmore Cottage “in his own hands,” for the “greater accommodation at Windsor.” The new king envisioned eventually handing over Frogmore House to his eldest son, Edward, known as David, “ when he sets up an establishment of his own.”George also planned for Frogmore Cottage to be used as a “bachelor annexe” for male guests and their suites, as well as a grace and favour” residence. In June 1912, Queen Mary decided that her daughter, Princess Mary, then age 15, and her governess would stay for a few weeks at Frogmore Cottage, instead of Windsor Castle. The Queen made the decision for two reasons. Princess Mary’s new “suite of apartments” were not yet ready and Queen Mary was “anxious that her daughter’s education should not be interrupted” because of a house party – it was Ascot Week -- that was underway at the Castle. The Cottage was described as a “pretty little residence in Windsor Forest,” that Queen Mary contemplated converting the house into a residence for the royal children when Court was at Windsor. Every morning, the young princess had a lesson in Scripture before breakfast and Queen Mary was insistent that she read at least one chapter of her Bible each day. The following year, the King and Queen were expected to spend Easter at York Cottage and not at Windsor. It had been reported that they would stay at Frogmore Cottage “but the smallness of that otherwise charming little abode would alone render such a project impossible.” They could not stay at Frogmore House, as the King’s aunt, Princess Helena, and her husband, Prince Christian, had been living there for eighteen months as their home, Cumberland Lodge, was under renovation. The rebuilding of Cumberland Lodge in Windsor Great Park was completed in December 1912, but Prince and Princess Christian were not able to move back in until the spring of 1913. Mary’s plans for a country retreat for her children was put on hold as in the fall of 1912, the king offered Frogmore House or Frogmore Cottage to the Duke and Duchess of Teck, who had recently given up their home in Holkham. Queen Mary had wanted Princess Mary to continue to “occupy this house whenever convenient,” but if the Duke and Duchess of Teck accepted the King’s offer, arrangements would be made for Princess Mary to use Frogmore House. The Duke and Duchess of Teck did accept the King’s kind offer to use Frogmore Cottage. They also had a lease for a home on Devonshire Place in London, which they gave up in August 1919. The Court Circular noted that the Marquess and Marchioness of Cambridge returned to Frogmore Cottage, where they remained until September after their younger daughter’s wedding. Lord and Lady Cambridge settled into a new home, Shotten Hall, in Shrewsbury. 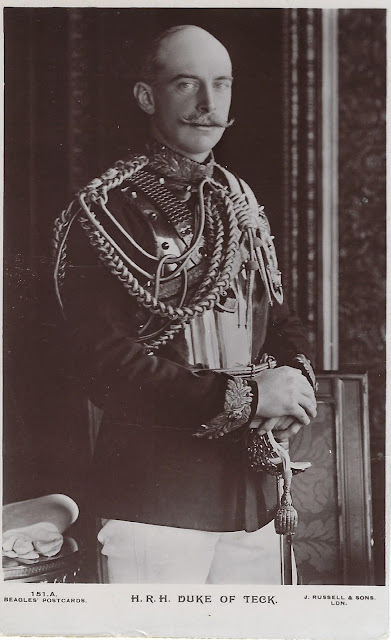 The change of titles came in July 1917 when the Duke renounced his German titles and was created the Marquess of Cambridge, Earl of Eltham and Viscount Northallerton. Lord Cambridge’s four children ceased to be styled as princes and princesses of Teck and adopted the style and precedence of children of a marquess. The eldest son, George, was known as the Earl of Eltham. His younger siblings were Lady Mary, Lady Helena, and Lord Frederick Cambridge. The Marquess chose Cambridge as the family’s surname, as his mother, the late Princess Mary Adelaide, was born a Princess of Cambridge, the youngest of the three children of the Duke and Duchess of Cambridge. All four of the children spent a good part of their youth at Frogmore Cottage. 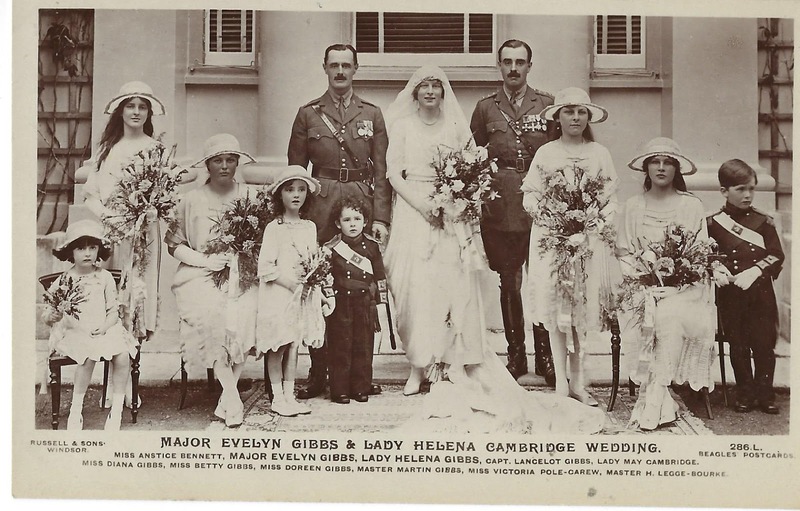 Lady Helena’s engagement to Major John Evelyn Gibbs of the Coldstream Guards was announced on July 18, 1919, with the wedding scheduled to take place at St. George’s Chapel at Windsor Castle on September 2. 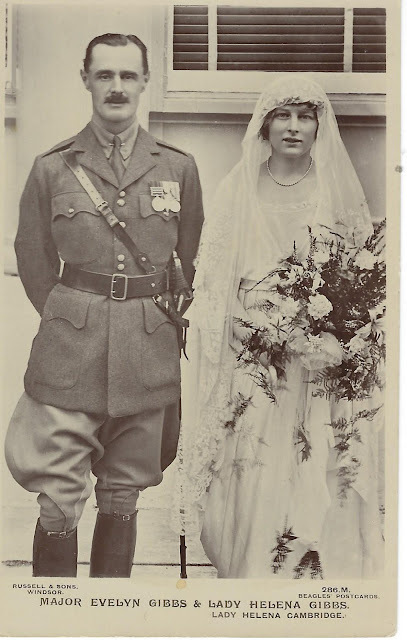 It was the first royal wedding at St. George’s Chapel since June 1905, when Princess Margaret of Connaught, a granddaughter of Queen Victoria, married Hereditary Prince Gustav Adolf of Sweden - the future King Gustav VI Adolf, the grandfather of the present King Carl XVI Gustav. all three postcards: Marlene A. Eilers Koenig Collection. 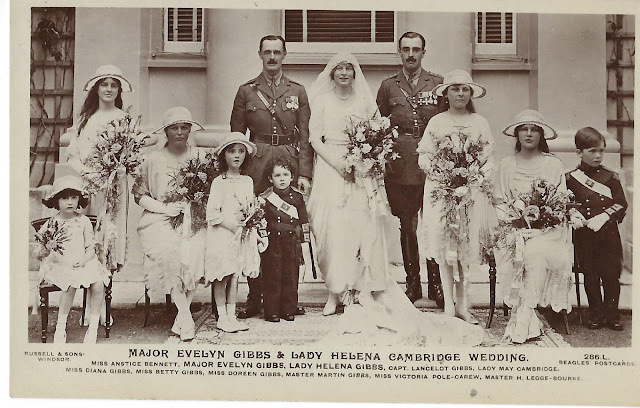 Lady Helena is the only royal bride who has dressed for her wedding at Frogmore Cottage. A Royal Landau drawn by a pair of greys brought the bride and her father to the chapel’s western entrance. The reception was held at Frogmore House with the permission of King George V, who was unable to attend the wedding as he and Queen Mary were at Balmoral. Frogmore Cottage was “too small” for the wedding reception. As Colonel Gibbs was based in Windsor, King George V granted the lease of Frogmore to Lady Helena and her husband in the early 1920s. In the 1925 Berkshire Electoral Register, Gibbs is listed as a resident of Frogmore Cottage, along with several servants. They would soon move out to another home as Frogmore Cottage was about to become the home of King George V' first cousin, Grand Duchess Xenia of Russia. Xenia was one of the two surviving sisters of the late Russian Emperor, Nicholas II, who was executed with his family by the Bolsheviks at Ekaterinburg in July 1918. Grand Duchess Xenia, who was married to Grand Duke Alexander Mikhailovich of Russia, was finally able to leave Russia in early 1919. Her financial situation was dire and George decided to offer her Frogmore Cottage. She sent a letter to the King, expressing her gratitude for his kindness. "Really Georgie, it is too good & kind of you." There was no public announcement that the Grand Duchess would be moving into the house, officially known as "Grace & favour apartment 9." Prince Nicholas of Greece wrote to Xenia about her move into the "pretty little house," which had about twenty-three rooms, but only one toilet "that was fitted out in a manner which suggested a stubborn devotion to the sixteenth century." Prince Nicholas was a first cousin to both King George V and Grand Duchess Xenia. His daughter Marina married the Duke of Kent in 1934. Xenia was not living alone in the house. She was joined by several of her sons and their families. When it became too crowded, George V also offered Home Park Cottage (formerly named Frogmore Lodge), which was opposite Frogmore Cottage, as overflow for her large family. A Ministry of Works official in 1929 found that cottage was in "deplorable condition," as the house had not been "touched for several years." Wallpaper was tearing off the walls, the ceilings were dirty and the plaster was breaking off from the walls. The house needed more than a mere lick of paint. George wanted his cousin to be "made as comfortable as possible" so arrangements were made to install gas lighting. There was one major problem when the Ministry of Works asked about who would pay for all the refurbishments. Residents of grace and favour homes were required to pay for all internal changes, but Grand Duchess Xenia, a close relative of the king, was in no position to pay. Bills would be quibbled over, but all the work - from installing hot water pipes to the installation of a "second-hand" gas stove from the Castle -- were paid for by King George V.
By 1934, twenty-one people were living at Frogmore Cottage. A plan to move the family into Frogmore House was vetoed. King George did approve of the addition of a new wing that would include three bedrooms and another bathroom. Again, all the expenses were paid for by the king. On occasion, King George V invited Xenia to tea, sending a car with two footmen to bring her to the castle. He also provided her with a £2400 annual pension. In his book, The Boy Who Would Be Tsar, Prince Andrew Romanoff, a grandson of Grand Duchess Xenia, wrote briefly about living at Windsor. He lived with his nanny in a building near the Cottage. I expect this residence was Home Park Cottage. Andrew, who was born in London in 1923, noticed the distance between the two families. One afternoon, he was riding his bicycle on the palace grounds when he met Princess Elizabeth. He said to her: "How do you do?" before getting back on his bike and riding back home. That night, the family received a phone call from the castle. Xenia's family would not be able to walk in the private gardens when their British cousins were staying at Windsor Castle. The young Andrew also remembered another incident when "three enormous packages" were delivered to Frogmore Cottage. Andrew and siblings opened the packages to find very large chocolate Easter eggs, One egg was as tall as Andrew. Then came the phone call from the Castle. The packages were meant for Princess Elizabeth and Princess Margaret. Too late ... Andrew and his siblings had devoured the eggs. Christmas was celebrated at Frogmore Cottage. The children would perform plays for the adults before tearing open dozens of presents. Each child's gifts were placed on a separate couch. "There were at least six different couches," Andrew wrote. King George V died in January 1936. His son, King Edward VIII, decided that he wanted to retain Frogmore Cottage for "the immediate royal family," and sent word to the Grand Duchess. He offered Wilderness House, at Hampton Court, another "grace and favor" home. The late king's sister, Queen Maud of Norway, in a letter to Queen Mary, appeared relieved that Xenia was leaving Frogmore Cottage. Hampton Court "will be further away for all her tiresome family." Grand Duchess Xenia and her family moved to Wilderness House in November 1936. Coryne Hall and John van der Kiste's biography, Once a Grand Duchess, provides more details on Xenia's time at Frogmore Cottage, including the costs of renovations and additions. This begs the question -- what happened next to Frogmore House after the Grand Duchess was "chucked out." In 1937, British and American newspapers reported that Queen Mary would move into the Cottage. One newspaper reported that she "had made several visits to the cottage recently to give instructions for the decorations and furnishings." The cottage was described "as extremely comfortable and well- arranged." Queen Mary was not expected to "take possession" of the Cottage until the fall of 1937. There are no references, not even in James Pope-Hennessy's classic biography, Queen Mary, about the queen using Frogmore House. Within two years, Britain was again at war with Germany and Mary spent most of the war at Badminton House, the home of the Duke and Duchess of Beaufort, The Duchess was her niece, the former Lady Mary Cambridge, elder sister of Lady Helena Gibbs. In November 1947, just a few weeks before Princess Elizabeth married Prince Philip, the deputy manager of Windsor Great Park went to Balmoral to meet with King George VI to discuss "another home" for Princess Elizabeth and Lt. Philip Mountbatten. 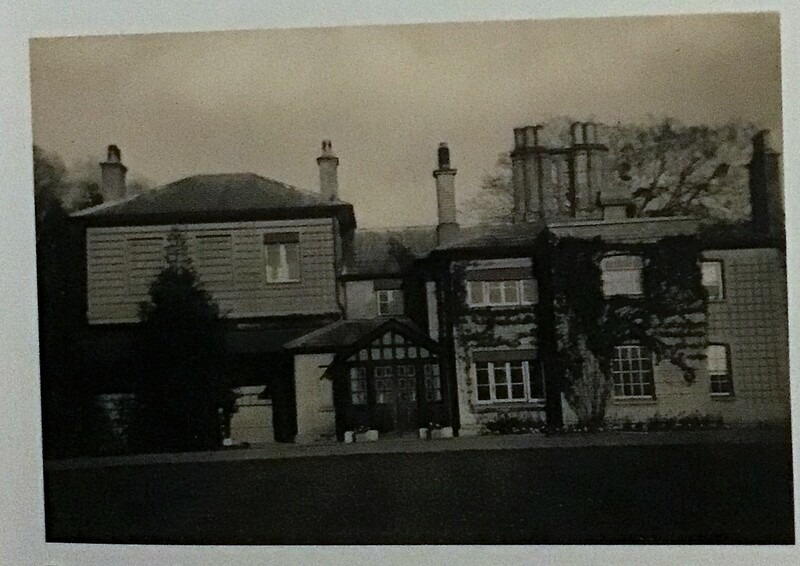 Their proposed country home, Sunninghill Park, was largely destroyed by fire only a few days earlier. One of E.H. Savill's suggestion was Frogmore Cottage, but this suggestion was not accepted. The Cottage had already been divided into several apartments for Windsor Castle Staff. I expect this had been done in the early 1940s, as the Berkshire Electoral Register lists five couples living at the Cottage including Florence and Henry Shurley. The Shurleys continued to live in one apartment at the Cottage until the 1960s. Unfortunately, the Electoral Register did not include occupations of the residents of Frogmore Cottage. Harry Shurley's death notice in The Times notes that he died "peacefully, at Frogmore Cottage, Windsor Castle, his beloved home, on February 16, 1965. Now, nearly fifty-five years later, Frogmore Cottage will once again become a home, this time a royal residence, the home of the Duke and Duchess of Sussex and their growing family. Perhaps, they will feel as, as Queen Charlotte did, that Frogmore will be a "calm retreat." One hopes that Harry and Meghan will see Frogmore Cottage as their "beloved home," just as Harry Shurley did. Brilliantly written and researched! A pleasure to read. Why did the Windsor dislike the Grand Duchess and her family's company at Windsor? Why did they not want to have contact with them even (the situation with Lilibet)? Have you been keeping up with any of the tabloid garbage, they have been especially bad against Meghan lately. Considering your readership now, I'd love if you could help to refute some of this trash, it's much worse than I've seen in a long time. Xenia was close to her first cousin, Princess Victoria, and they saw each other often. There would be visits from George and Mary and Xenia would get invited for tea. I think there was a general disconnect on a more social relationship with foreign cousins, especially as the grandchildren were not closely related. Edward VIII wanted frogmore cottage for his immediate family -- so Xenia got tossed out -- and moved to Wilderness Cottage at Hampton Court, further away. Her two first cousins (Victoria and George V) were dead. Oh ok, thanks. They're so cruel to her. There's a racial element to it too, despite what anyone says to contrary. Thanks ... more about research ... and putting the information together. I'm not a history person but this story was amazing. I live in Virginia right outside of Williamsburg so I've had a lot of Va history with the British side. Thanks again for a well written story. Escribí este comentario antes y no se si se publicó. Usted realmente sabe investigar y transmitir las historias, los momentos. Y de una manera amena, hacernos conocer las personas y los lugares de esas historias. He dado con usted a través de Twitter y no me arrepiento! Having read an authorized as well as an unauthorized biography of Princess Marina, Duchess of Kent, one realizes that the fortunes of European royalty were often very unstable. Some left their countries with little more than their titles and a few jewels. And one has to remember that the public eye even then was on the expenditures of the royal family. Supporting an extra household of 21 people can't have been easy even for a king whose purse strings were under scrutiny. Andrew talked to me directly about how the British Royal Family treated Grand Duchess Xenia (his grandmother) and his family. George V was very kind to her but her husband and all the Grand Dukes who survived with the exception of one were prevented from even visiting Great Britain. This is particularly galling because Russia was a key ally in WWI. Andrew said that Elizabeth was always kind and friendly to him but her parents were not. Andrew and his parents and family were considered "poor relations". Edward VIII was particularly unkind to them.